Each time it prepares to release a new movie, Pixar redecorates its Emeryville, Calif., studio to match the theme of the film. This year, in anticipation of Monsters University, the studio was transformed into the MU campus, complete with a student lounge, cheerleaders, and the fabled Monsters University gates. We, along with several other members of the press, got to visit the freshly transformed Pixar campus for "Freshman Orientation," and we snagged some photos of its collegiate accoutrements. As you can see, Sulley and Mike (who are long-time fixtures of the Pixar lobby) got into the spirit, donning college attire and hitting the books. As visitors leave the parking lot and step onto the studio grounds, they must first pass through the Monsters University gates. Note the year in which the college was founded. Out in front of the main building, student club tables are set up, along with a pair of message boards plastered with student notices. The Smile Squad was on hand to welcome freshmen to campus. One employee decided to dress up as Ms. Squibbles, mother of Oozma Kappa fraternity member Squishy Squibbles. She's got nice eyes. Inside, the MU sorority and fraternity banners decorated the walls. If you look just to the right of the Oozma Kappa banner (the green banner) you can get a small peek at the Oozma Kappa house, which was replicated upstairs. Sadly, the walls are covered in secret concept art and no photos are permitted up there. Students could kick up their feet (and charge their laptops) in the student lounge. And yes, they really made student IDs. MU Beer Pong, with a Mike Wazowski ping pong ball! 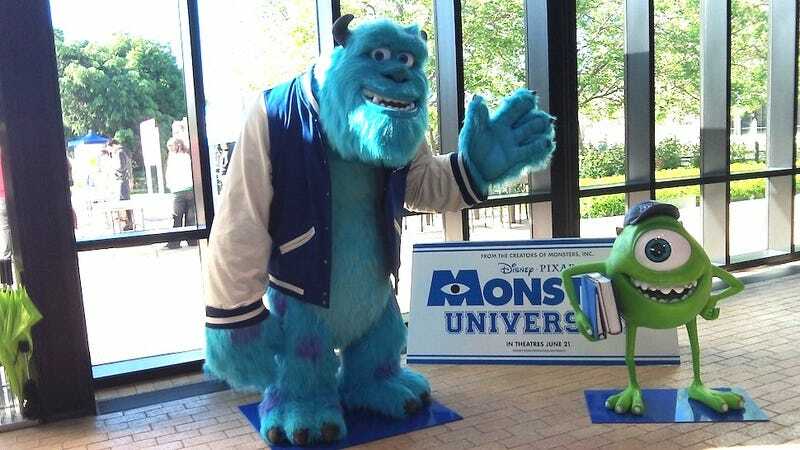 Finally, at the back of the lobby, we get an image of Sulley and Mike enjoying a sunny day at Monsters University. Check out the teeth on the Scaring School.